Ryan Villopoto is eager to repeat his $1 million win in 2011 at the 2012 Monster Energy Cup. 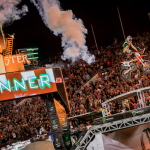 The Monster Energy Cup returns this Saturday, October 20, for its second year, providing motocross and supercross pro riders a shot at the $250,000 purse, with the winner walking away with a $100,000 check. 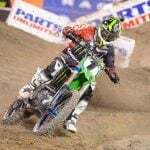 However, any rider that wins all three main events will take home an outrageously lucrative $1 million bounty, as Ryan Villopoto did in the inaugural 2011 event. Other confirmed riders for this year’s event include Ryan Dungey, Chad Reed, Kevin Windham, Tyla Rattray, Mike Alessi and Travis Baker, to name a few. 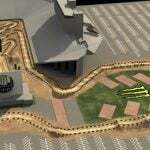 The 2012 Monster Energy Cup features an all-new track design inspired by five-time Supercross Class Champion Ricky Carmichael. The Carmichael-inspired track design will consist of supercross and motocross obstacles unlike any other racetrack design in the world. New to this year’s track will be a 200-foot banked sweeping turn that will be built in the stands, two 11 rider starting gates split by 220 feet before they converge at the apex of the 300-foot start straight, and the joker lane that riders will have to race through at least once during laps 2-10. After racing through these sections of the track, fans will be treated to equally exciting racing lanes that are built into the Monster Energy Fan Zone, which is located outside of the stadium. SPEED is planning to provide 3.5 hours of live television coverage starting at 7 p.m PST/10 p.m. EST.